Nolensville is considered one of "America's fastest growing suburbs." Brian Snyder said, "It's a little bit like Mayberry in modern day." Nolensville looks a lot different than it did a decade ago. Addie Grace said, "When I first moved here, there was only a town hall and a Dollar General." Grayson Wallace said, "When I moved here, it was just fields with cows and corn, that's about all I ever saw." Realtor.com just listed the town as one of the top 10 fastest growing suburban areas in America. Snyder said, "So the median home price is $511,000." It seems like there's home construction on every street. 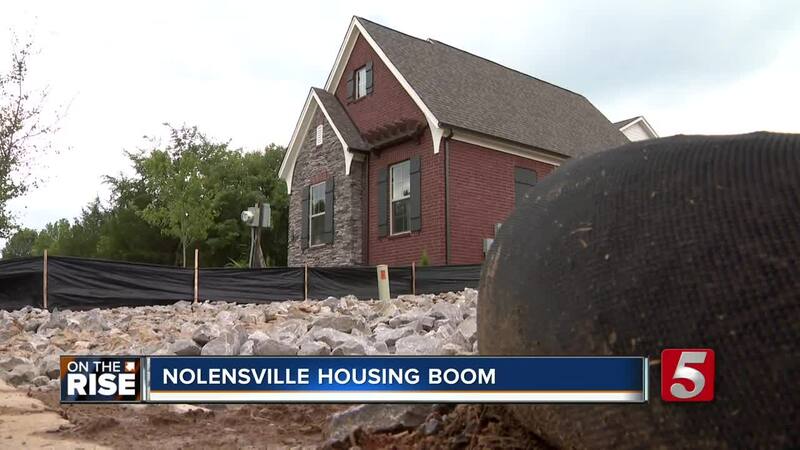 According to Nolensville town officials, on average, they're building an average of 200 homes a month. Snyder said, "Three year price appreciation of 34%, a 3 year home listing increase of 55%." Alderman Brian Snyder moved to the Bent Creek neighborhood 12 years ago. His development alone has almost 800 homes. Snyder said, "Kids come out from school and they run next door and they run through the trails, get to their friends house, they can ride their bikes." Over 5,000 people have moved to Nolensville in 8 years. Snyder said, "Young families, Young professionals..."
He attributes it to a good school system, the lowest property tax rate in the county, and location. Snyder said, "We're close to Cool Springs, we're close to Brentwood, Franklin, close to Smyrna, even close to Murfreesboro." But with growth, comes growing pains. Snyder said, "Because we have high residential, low commercial, we don't have a lot of property taxes so we're always behind the 8 ball maintaining some of our infrastructure so those can be negatives." Town officials are making sure they don't get too big for their britches. Snyder said, "I think we need to look at, what does it mean to diversify our housing options. I think we need to look at new opportunities for affordable housing and see what that feels like." As for now, it doesn't look like the 'boom in the burbs' is slowing down any time soon. Snyder said he can count at least 10 neighborhoods being built in town. Nolensville High School opened in 2016 to accommodate the population boom. They will have their first graduating class in 2019.